"Fresh & Easy"? Tesco stales on U.S. Market, will close stores. Or, will Trader Joe's acquire them? About five years ago, Tesco, the U.K.'s largest grocery chain, started opening Fresh & Easy stores in California. When the first stores were opened, the chain most grocery-industry observers compared it to was, in fact, Trader Joe's. It was sure not a Trader Joe's-style success with customers. After an investment of over $2 billion, and after opening nearly 200 outlets in California, Arizona, and Nevada, it now seems as if Tesco is poised to sell off the chain or -- if it fails to find a buyer -- just shut it down. The Fresh & Easy concept has not, obviously, attracted the business or generated the profit Tesco hoped for. That said, it's developed a few fans, and at least a few commentators have wondered out loud whether Trader Joe's is interested in buying it up. I have no way of knowing whether Trader Joe's is seriously considering a bid for Fresh & Easy -- the famously secretive TJ's management (maybe I should call them the 'Admirals' in Monrovia, in keeping with the 'crew member', 'Captain' nautical theme) isn't talking. What's interesting to me is, now that Tesco's stale on Fresh & Easy, people in the business are saying, "Of course it failed. The 10,000 square foot stores were too small; Americans are used to shopping in huge supermarkets. The idiosyncratic mix of own-brand products included many unfamiliar items customers here had never seen before. And there were basic, staple items that the store didn't carry at all, so a harried suburban mom could not just run into one store and do all her shopping." All of those criticisms could, in fact, be leveled at Trader Joe's, but those problems have certainly not hurt Trader Joe's. 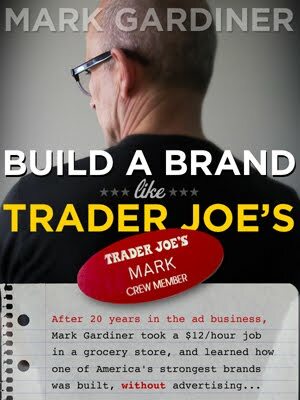 In fact, Trader Joe's customers would often cite the small store footprint and unique Trader Joe's-brand items as strengths, not weaknesses. While it's definitely true that the Fresh & Easy product mix and concept should probably be tweaked by any company that buys it up -- that's if any company buys it up -- I have to wonder how the chain would have fared if it had adopted one more Trader Joe's trait... friendly, decently paid and treated staff who are empowered to do whatever it takes to make a customer's day. Just two years after the long time owner of Trader Joe's, Theo Albrecht Sr. died, his son and heir Berthold Albrecht has also kicked the bucket. Bertie was a comparatively young 58. In the obsessively private spirit of Berthold's dad, his family placed a full-page death notice in the Handelsblatt (Germany) newspaper, but neglected to mention either the date, place, or cause of death. The wording of the notice, describing him as "a fighter to the end" suggests that Berthold had been sick for a while. Two years ago, Berthold inherited half of Trader Joe's, along with the far larger Aldi Nord holdings in Europe when his father died. He was the chairman of the Berthold family trust that controlled Aldi Nord and its Trader Joe's subsidiary here in the U.S. He did not, however, play an active role in the companies' management. His older brother Theo Jr. continues to do so, and retail industry watchers in Germany feel that Bertie's death will have little immediate impact. Theo Sr.'s death can have no impact at all on Aldi stores here in the U.S., as they are owned by Aldi Sud, the half of the Aldi empire that is still controlled by Theo Sr.'s 92 year-old brother Karl. According to the Bloomberg 'Billionaires Index' -- yes, there are enough billionaires, it seems, to warrant a sort of Field Guide -- Bertie's fortune was estimated at $10.7 billion. There's no word on how much of that was contributed by sales of Two Buck Chuck. Clearly, they don't maintain the highest stanadars of copy editing. Maybe not of cleanliness, either. There's more hysteria over listeria, as about 5,000 pounds of Trader Joe's Butter Chicken has been recalled after reports it was contaminated by listeria, a bacteria commonly associated with run of the mill food-poisoning symptoms like nausea and diarrhea. While listeria is rarely harmful to healthy adults, it is extremely dangerous during pregnancy. 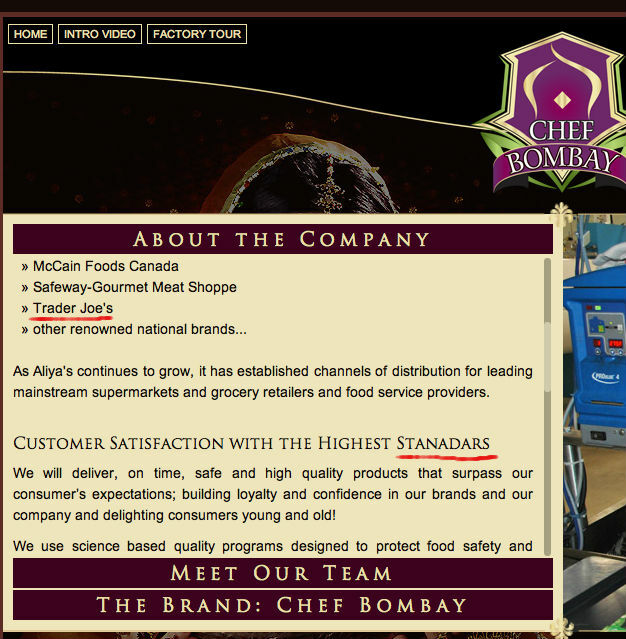 The recall was actually initiated by Canadian authorities, since the butter chicken supplier is Aliya Foods of Sherwood Park, Alberta. Aliya Foods sells to Trader Joe's (of course) and supplies other private label Indian foods, as well as selling under its own 'Chef Bombay' brand.